Kids can never seem to get enough of classic googly wiggle eyes! Hysterical massive giant wiggle eyes turn almost anything into a hilarious gag, crafting embellishments, Halloween Ghost Monster or Christmas Snowman decoration. These BIG googly eyes are just like their smaller counterparts, only enormously larger! 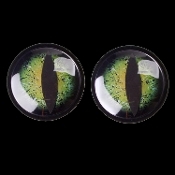 Monsters, clowns and other crazy creatures come to life with this pair of large Scary Iridescent CREEPY DRAGON KITTY BLACK CAT wiggle eyes. High quality DARICE brand Jumbo Googly Eyes make fun party decorations. Giant funny swirling Iridescent CREEPY DRAGON BLACK CAT wiggle googly eyes. Classic round shape brings any inanimate object to life, for loads of creepy Halloween party fun or funny gag any time. Think of what you can create with these large eyes. Monsters, clowns and other crazy creatures come to life with this pair of large wiggle eyes. Surprise friends, family and co-workers by attaching these wiggle eyes to refrigerator, garage door, water cooler or anywhere you want to bring a smile. Ideal jiggly additions for crafts projects, costume making, and much more! High quality crafts decorations by Darice. Huge Size 6-inch (15cm) Diameter. ONE PAIR of Giant Iridescent DRAGON CAT Plastic Googly Eyes. - Ideal for decorating home, furniture, appliances, trees, mailboxes, cars, and more! The perfect decoration for your party or other themed event, these big googly eyes will have everyone's sights set high. Use to decorate trees, mailboxes and more!